Winter is coming be sure to check out these awesome winter activities. Price: 45-minute session — 50 UAH for adults and 30 UAH for children on any given day. Ice Arena at Cosmopolite mall is the closed ice skating rink. Here the musical accompaniment creates a cozy atmosphere and a good mood for visitors. There are four massive columns on the float, covered with soft elastic material on the bottom. They allow you to slow down while slipping and avoid hitting other skaters. Ice Arena is suitable for both beginners and experienced ice skaters. One of the oldest Kiev rinks near the Darnytsya metro station. 7 General Zhmachenko Street 800 square meters of space, there are rental skates, and even a class on figure skating – for adults and children. In addition, it is one of the cheapest rinks. Typically, during the week it is closed for skating, but it’s open on the weekends. Ticket – 25 UAH, rental – 10 UAH plus deposit (passport, rights). The rest of the time on the rink – training for children, skaters and hockey players. In middle December don’t for get to check places as Olympic village which is located on Troitska Square before NSK “Olympic”, At St. Michael’s Square Kyiv city government usually in winter time set up a large skating area of 2000 square meters. Every winter in national Expocenter of Ukraine “Snow Country” has an impressive ice rink, which is called the largest in the city. Its area – 4000 square meters. Protasiv Yar, one of the places where you can ski and snowboard in Kyiv, is located in the center, not far from Respublikansky Stadion metro station. Driving there is easy too – just look up the official address, 23A Protasiv Yar. The main advantage of this skiing slope is the central location. The hill is not too extreme and it often gets crowded. Instructors are available on site and night skiing and snowboarding is also an option. You can check for more information at http://www.gora.com.ua. At the beginning of the Podilsky Descent, there are several good slides, on which more than one generation of Kievs ride. There are steep and gentle slides, you can try to go skiing and go sliding with kids. Hill with impressive views of the Kyiv Sea is a 20-minute drive from Kiev. Length of the route – 200 meters, there is a conveyor lift for skiers and snowboarders, as well. After skiing you can eat in the cafe. There is night skiing (from 23:00 4:00 etc. ), follow the schedule. The cost of a night ski pass Mon-Fri 150 UAH, 250 UAH on weekend, rental ski or snowboard set – 250 UAH/night. The high season runs from 30.12.2017-14.01.2018 inclusive. For a “2 hour” tariff, a countdown starts from the moment of the first pass through the turnstile. Hourly subscription is valid only on the day of sale. The skipka card is multiple and can be used on other days of this season as well as in the following season. Subscriptions bought in the current season and not used before 30.03.2018 – canceled. In case of loss or non-use of the card – the cost of the subscription is not returned. Students and pensioners on weekdays from 10:00 to 12:00 go through turnstiles and use the lift for free, with a certificate. More information and the map here: http://vishgora.com.ua. In the beautiful Botanical gardeт you can find very steep slides, and more hills for snowboarding if you are beginner. In general the park has – about 10 slides and 5 slopes for fans of adrenaline.Botanical park also has a very steep hill with a large angle. It can be found among trees, local residents pour it with ice. 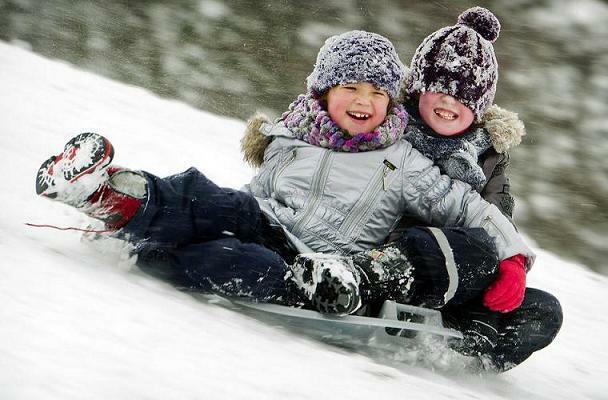 Lysa hora is perfect family adventure for skiing, sliding and snow balls fights. How do you get to Lysa Hora. It is located on the right bank of Kiev in the area of ​​Vydubychi, near the Dniper. Loaded roads seem to encircle this area on three sides, so turn to the building of the Ukrainian Hydrometeorological Institute where you can see the entrance to Lysa Hora, you really seem to “fall through” into another world. It’s easiest to get to Lysa Hora by metro. It is necessary to walk from the station Vydubychi a couple of hundred meters along the road to this place – the beginning of the track. From Lybidskaya or Demeevskaya stations by bus # 20 or trolleybus # 1 to the stop “Metrological”. For the lovers of hockey or for those who wants to try it for the first time here are the list of places where you can go. The nearest metro station: Petrovka, Obolon , Chernigovskaya, Darnitsa.